Fr Francois Mourad – santo subito! Monday, I head off to Quarr Abbey to participate in the Chant Forum being hosted there. No doubt the experts will reveal to me how inexpertly I sing chant! But that’s tomorrow. News is now emerging that Fr Francois Mourad, the hermit murdered by Syrian rebels last week, was not shot during an assault on his fledgling hermitage as we were first led to believe. No – he was beheaded by jihadist rebels in front of cheering crowds, and it is was recorded on film. The one mercy for me is that the monastery’s filtering system blocks this video (which is linked in the news story from Catholic Online). By all accounts on the Twittersphere, and elsewhere online, it is a sickening video. Don’t watch it unless you feel you need to see if the reporting is true. It will be very distressing. In Catholic terms we have a new martyr in Fr Francois, not yet raised to the altars but surely he must be in due time. He had told his bishop recently that, given the worsening situation, he was prepared to lay down his life for Christ. Christ has called him on that. So Fr Francois willingly accepted martyrdom fort Christ, and that willingness to die for Christ as a victim of hatred for Christ is essential for his future cause for canonization. That his was murdered in hatred of Christ cannot be in any doubt. Of course Fr Francois is the latest in a lengthening list of Christian victims of the “rebels” in Syria. Churches has been looted and destroyed, Christians killed, and the two Orthodox archbishops taken several weeks ago are yet to reappear. We must assume they are dead. Whatever the original justice in the cause of the first rebels in Syria all those months ago, the rebels are now largely jihadists of various stripes peddling a violent and hateful brand of Islam. Whatever their faults, the governments of Assad in Syria, Moubarak in Egypt and Saddam Hussein in Iraq offered protection to Christians who were able to live in relative peace and tranquility. The Middle East problem is not only about Muslim Arabs against Israel any more; it is about jihadist Islam seeking to wipe out both Judaism and Christianity, and whatever unacceptable Islamic sect gets in its way, so as to build a world caliphate. There is nothing alarmist in saying this; it is their stated aim. They are doing the Devil’s work. We must not arm the rebels in Syria. Have our governments learned nothing? I doubt we need to pray for Fr Francois. In fact, I intend to pray to him. I hope some proper authority introduces his cause for canonization soon. Fr Francois Mourad – santo subito! as the Italians would say. 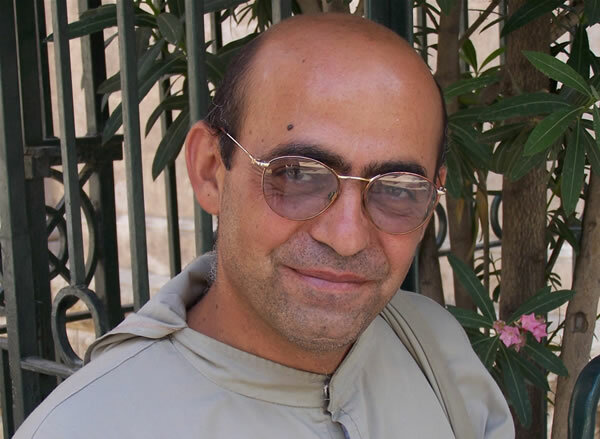 For now, Fr Francois Mourad, pray for us. Fr. Francois is before the Throne of God Most High as all Martyrs are. They ascend immediately to Him and behold His Face for all Eternity. He does wish to intercede for us so let us all pray to Fr. Francois. Where his blood was spilled is now sacred holy ground. May his self-sacrificing act of love for Jesus Christ and us bring about many many conversion in the land of Syria. I watched this and it was horrible. The crowds cheering while these murders took place. But I was amazed by one thing. Father Mourad and his companion that had their heads sawed off didn’t make a sound or move. I was awe inspired. Glory to God. I pray I will have their courage. I pray you never need more courage than that required for living the Christian life in a secular world. Mind you, that requires more courage than we might think. I won’t watch the film of Fr Francois’ murder, but the horror of it is not hard to imagine. Let us pray that the cause of this brave young priest, murdered for his unwavering faith, will advance quickly, and that knowledge of his martyrdom will spread. He will intercede for those hundreds of thousands of Christians being persecuted around the world. Thank you Fr Hugh for bringing this story to our attention. On a completely different matter, we are on holiday in the Isle of Wight for two weeks. Did we by any chance see you at the Mass of St Thomas this morning at St Cecilia’s Abbey? I think I recognised you from the picture on your blog. This breaks my heart – I remember hearing one interview in February last year warning that this would happen, but it was drowned out by the majority of reports supporting the rebels. We will keep Farther Francois and his companions in our prayers. Please do remember our brethren in Syria. As for Fr Francois, my advice is to pray once for him, then pray TO him. Is it really ok to pray to someone before they are canonised ? Absolutely – that’s how s/he gets canonized! Blessed John Henry Newman was beatified after a deacon prayed to him to obtain physical healing: the healing provided the needed miracle to beatify JHN. The difference is that prayer to those not yet saints, but who we believe with good cause to be in heaven, is private not public, and does not have ecclesiastical blessing (though neither is it forbidden). It is all part of the process. Years ago I knew a man who prayed to a sibling who died as a baby but after baptism: no problem, the little one was clearly in heaven!